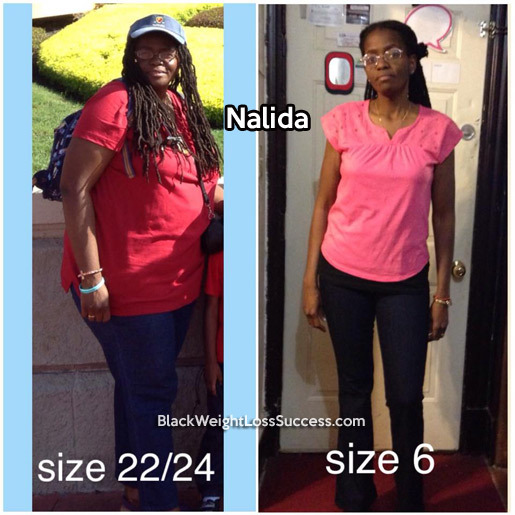 My name is Nalida and I want to share my health and fitness story. I started at 241 pounds (height: 5’8″), size 22-24, and a BMI of 36.7. After almost two years, I weigh 140 pounds, have a BMI of 21.3, and wear a size 6. I follow a whole foods, plant-based diet that is free of added sugar, oil, and salt. I exercise at home at least five times per week for 30 minutes. Most importantly, I pray for strength and insight to keep going on my journey. I started a Facebook page at a friends’ request to document my journey and share information with others who want to improve their health. It is www.facebook.com/PlantBasedGodsGrace. In July 2013, my family and I went to Orlando, FL and Disney World for the first time. We had a great time, but when I returned, I was stressed out and began experiencing extreme pain everywhere (fibromyalgia) in my body, including my gallbladder. I’d had gallstones for many years. I was in so much pain, even my skin hurt! I was on summer vacation as a teacher but I was not feeling well enough after returning from FL to really enjoy the time with my husband and children. One night, I looked at my youngest child’s face (my son was 6 at the time) and I knew that I didn’t want to just leave them now. I begged God to give me another chance to heal the body that He gave me. I knew I was too young to be feeling this badly and that I had abused my body with unhealthy food and stress. On July 25, 2013, I began my health journey. I have been a vegetarian all my life but unfortunately was a junk food vegetarian. I changed to a healthy vegetarian, eating whole, plant-based foods. I had several books by Dr. Joel Fuhrman that I had looked at but never really read. I picked up his book Eat to Live and started to read it earnestly. That was one of the best decisions that I made, Thank God! I resolved to eat to live and not live to eat unhealthily. By December 2013, I had cut out all oils but still not all the sugar that I kept eating during the holidays in commercial vegan desserts. My gallbladder was still acting up, On December 27, 2013, I stopped eating sugar and have not touched it since. No more gallbladder pain! Abstaining from it was the only way I could do it because I was a sugar addict and could not moderate my use of sugar. One bite always lead to more. It’s actually easier for me to just abstain from sugar. I was eating more fruits, vegetables (cooked and raw) including greens and sweet potatoes. I ate whole grains, like corn, and some limited healthy fats, like walnuts, avocado and ground flax seeds for omega-3 fatty acids. However, I still had not given up salt completely. I still continued to watch a lot of YouTube videos and read Facebook pages from the plant-based community. I had lost over 75% of the weight I wanted to lose by January 2014. On Facebook, I reached out to a plant-based chef named Chef AJ who gave me some great tips to cut out the salt and add seasonings for great taste. Without all the added salt, my appetite decreased even more. My husband and three children still liked my cooking without the sugar, oil, and salt (but including the herbs, spices, tomato paste, nutritional yeast in some recipes) and our taste buds adjusted. I joined Chef AJ’s page and group along with some pages following Dr. Fuhrman’s Nutritarian plan. I also joined other plant-based pages for more support, encouragement, and information. I also prayed my way through this journey and sought counseling through a faith-based, Catholic Christian counselor as well. Finally, I have logged my food and exercise every day since July 25, 2013 using an app called LoseIt! which keeps me accountable. What did you stop or start eating? I stopped eating refined sugar, oil, and salt. I started to eat more fruits, vegetables, beans and mushrooms (that I never really liked, but they are a superfood so I learned to cook them and like them). I definitely eat more sweet potatoes, yams, bean/veggie stews, some whole grains and some nuts and seeds. Basically, I began to eat clean, whole, plant-based foods SOS-free (sugar, oil, and salt free). I learned to make healthy desserts with whole grains and other plant-based foods, sweetened with fruits like bananas, berries, and dates. I worked at least five times per week for at least 30 minutes and I continue to do so today. I work three different body parts by weight training three days per week with light weights as well as using my own body weight. I do aerobics with a kickboxing DVD or walking DVD. I did not use a gym because I know it would be a lot to get there with all my responsibilities. I have three children who have special needs. My living room became and still is my gym! I also do some outdoor walking when I can. Because I am an itinerant teacher of students who are blind or visually impaired and travel to several schools, I plan out some of my walking by walking from one school to another that may be in the same neighborhood, and then drive to other schools outside the neighborhood. It took me 25 months. I began in July 2013 and reached my goal weight in August 2015. My goal was to lose 100 pounds and I have lost 101. I now want to lose more fat, especially around my abdominal area where it is a risk factor for some diseases to carry extra fat. Also, I want to add more muscle. I will continue working on these goals. Find your motivation; health, wanting to be around for your family, wanting to honor your body as the temple of the Holy Spirit, caring for that body, etc. Pray when you are tempted to make unhealthy decisions. Log ALL foods eaten. Studies show that those who succeed and keep the weight off are likely to have kept some kind of food journal (paper or electronic). Set a workout routine that is written down and posted in at least two places, including the room where you workout if it is at home. Read books on health and watch health documentaries, like Forks Over Knives on Netflix. You can also watch health videos on Youtube. I watch a lot of videos from plant-based doctors and other experts for information and encouragement. Make it a lifestyle change that you continue for life and not as a temporary diet. Also, throw away all unhealthy food and start eating healthy immediately. I threw away all the cookies and chips when I began, much to the dismay of my children and husband. I replaced them with fruit bowls, veggies, nuts and seeds, so we had healthy snacks. I also made fruit sweetened granola bars or bought sugar-oil-salt free bars that included only dried fruits and nuts. Congratulations!!! Thanks for sharing your story! It’s an inspiration and true testament to never give up and with God all things are possible. May God continue to bless and keep you making right choices. Thank you! Yes all things are possible through the Lord.